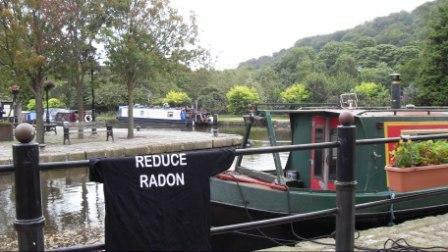 PropertECO has continued the Radon Tee World Trek this week with a visit to West Yorkshire and the market town of Hebden Bridge. While visiting the town to carry out a survey on a commercial property found to contain high levels of radon, PropertECO’s Martin Freeman took Radon Tee out & about to see the sights of the medieval town, including the Rochdale Canal that passes through the town. Many employers in the region may not be aware of radon gas, however as the town is located in a so-called ‘affected area’, they are required by law to carry out a radon risk assessment as part of their overall health and safety responsibilities. Carrying out a radon risk assessment in a workplace is simple and inexpensive, and involves placing a number of detectors in the property for a period of three months. The number of detectors required will depend upon the size, layout and type of building however PropertECO are able to advise on the correct number & placing of these. We can supply you with however many detectors you require, analyse them in our independent laboratory and send you an easily-understandable report detailing the level of radon detected and whether any further action is necessary, with prices starting from under £20 per detector. If you are an employer located in an affected area, or your workplace has a basement, contact us today to discuss how we can assist with fulfilling your testing obligations.